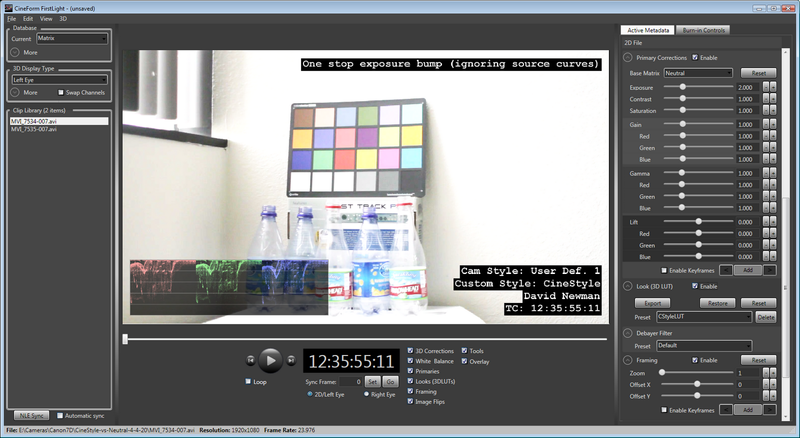 GoPro/CineForm Insider: Curves - CineStyle and S-Log, a workflow choice. 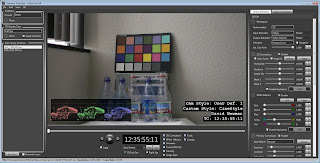 If understand it correctly, I could use Workspace to convert CineStyle to Linear Light? Could I use it to create a chip chart (Lin to CineStyle) to create my own LUT externally? That is correct. This is what I did to determine the curve in the first place. Shoot a chip with a neutral profile (assumed this was approximately 2.2 gamma) then converted that to linear. Switched to CineStyle and shot the same chart (locked down.) Then plotted the curve difference convert form linear to CineStyle, flipped the axis to determine CineStyle back to linear. I then modeled this curve for use in FirstLight. So, this is the best of the a non-raw approach. The difference is, when operating with raw files, the bit depth is not altered. Here, applying sequentially the gamma curves decrease the bit depth? No. If we where to apply a series of 8-bit LUTs for the curves, that would be bad, as less than 256 values would survive. All curves here are continuous math functions so all input levels are preserved, whether the source was 12-bit RAW or 8-bit H.264. 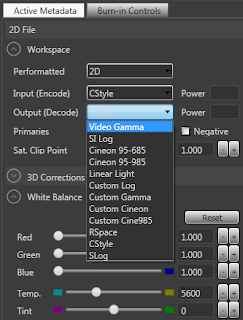 In camera CineStyle selects the best range of 8-bit values (from deeper precision data) to maximize shadow detail without hurting tonal range. Of course, got your point, thanks. I bought Cineform Neo last night. I used the Cinestyle picture profile on all my footage with my 7D. In FirstLight I did set Workspace>Decode As 2D, Encode Curve CStyle, Decode Curve CStyle. But under Look (3D LUT) > Look ; I cannot find the Cinestyle S-Curve or Look. It is just not on the list. The closest one (at least one that gives me a nice looking result) is called CF_FilmStyle_5279. 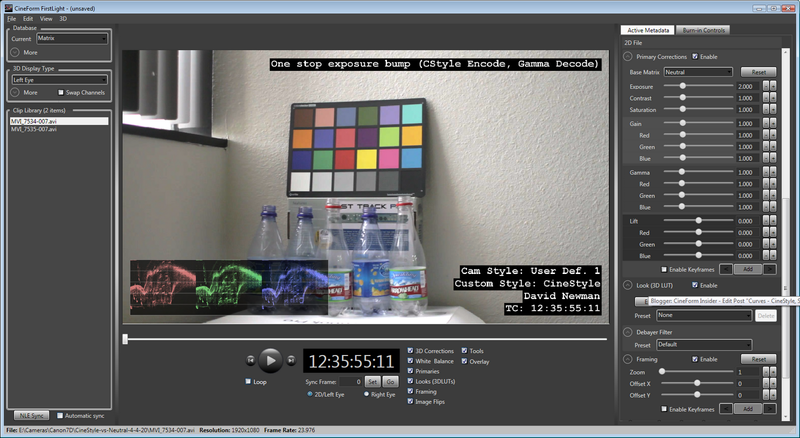 Do I need to download that particular Cinestyle 'Look' and somehow install it into FirstLight? I have FirstLight Version 5.5.4.98 for Mac. Excellent David. If I use this look, what should I pick for encode and decode? Also, how can I install this file? Should I copy this look file into a certain folder? Which one? I am a Mac user. Thanks VERY much for both present and future answers!! I have been in touch with the Cineform products for a long time in past, when Mr. David Taylor was there. Now a days, I am learning 3D editing using Neo 3D and Adobe PP CS 5.5. Here is a request to you. 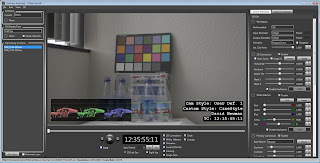 Is it possible to provide some such facility in Firstlight that may be used to convert a 2D video into 3D? 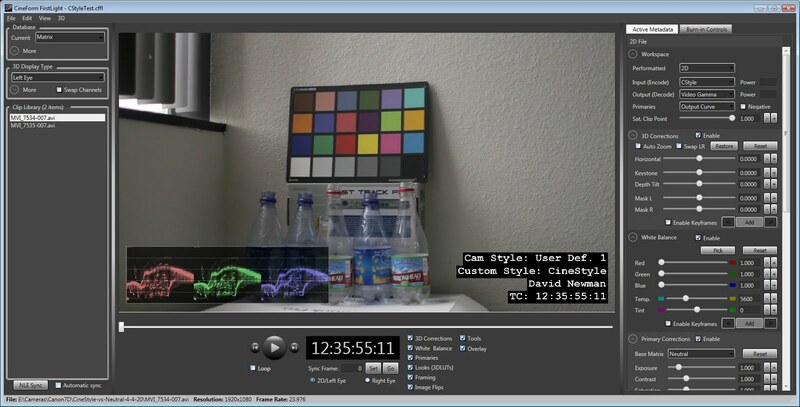 Two eyes files are needed to produce a 3D video- Left and Right. If we treat a 2D video as Left eye file, is it possible to create a virtual Right eye file from this left eye file, using some kind of perspective manipulation and interpolation? i.e. if we have the left eye view then what would have been the right eye view, is we know that both eyes are 65mm apart? Can I get your e-mail ID as well? They are many companies developing 2D to 3D conversion tool, but that is not in our plans (nor do I have recommendations.) You can use these external tools to generate right eye data, then use the CineForm 3D editing workflow. And when i try to add .mov to FirstLight? it says "There was a problem initilizing the player. Please try re-starting First Light"
Sound like a question for support. I'm a newbie using Cineform and FCP 7. I have noticeable color shifts on my Toshiba passive display when switching between the two. Cineform has less contrast, milky and soft. Gamma is set to 2.2 as well. Switching between the two? Source and CineForm? Depending of the camera type, CineForm conversions fixes some black and white level issues (Canon DSLR) so you get mode dynamic range. Increase dynamic range will be seen as reduced contrast / milkiness. If is not softer, yet perceived sharpness is related to contrast. So you are seeing good things, just takes a little getting used to -- the end result is better looking productions. Can anyone please provide an exact one-line formula for programming purposes (coding a color correction shader for games and video player) for both converting linear color space to log, and converting log back to linear?